Well, it’s been a long while… but after a 202 day hiatus from posting I’m finally back! Before I get into the recipe let me just take a moment to say thank you to all of my followers and fans for their continued support despite the absence of new posts. You guys are truly awesome. So it’s Fall here along the Atlantic Coast in Northeastern USA, and we’re starting to turn to heartier fare. The other day my beautiful wife asked me to make something hearty and comforting, a soup or something along those lines, but also a little spicy. Immediately my mind went to Gumbo. I will preface the recipe by saying that it’s slightly non-traditional in a few ways. First and foremost I use beer in my recipe, this is not entirely common. Also, I do not use okra… Quite frankly I hate the stuff. However, okra is not a required ingredient for a true gumbo, though some may say differently. It’s perfectly acceptable to use roux as a thickener instead. Lastly, I use Sriracha. Yes, I know, that’s an Asian condiment and this is a Southern Cajun/Creole dish… but think about it, Sriracha is smokey and spicy and full of flavors that are perfect for Gumbo! 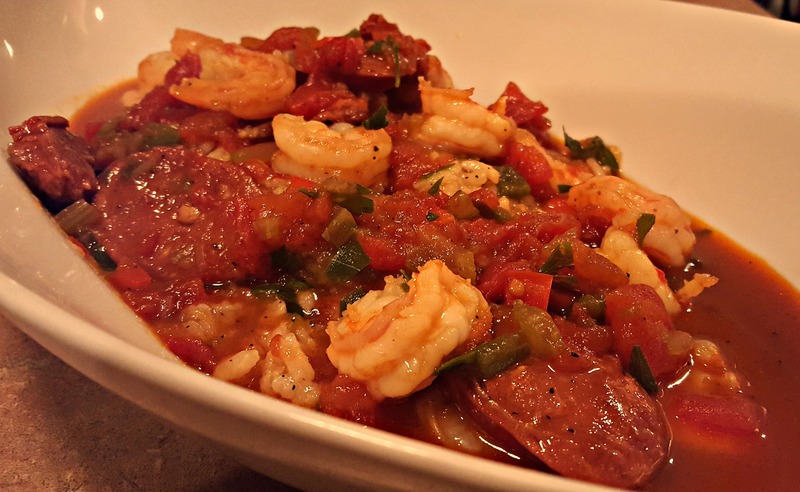 So here you have it, my first post in over 200 days… Gumbo! So the hardest part of this dish is the prep. Once that’s done it’s a walk in the park. Melt the butter in a large pot (I use an 8qt) at medium-high heat. Add the chopped bell peppers, celery and sliced onion along with 1tsp of salt. Cook until the vegetables start to sweat, about 5 minutes, stirring periodically. Increase the heat to high and add the all purpose flour, which will form your roux. Cook until the flour starts to brown, stirring constantly to stop it from sticking to the bottom and burning. Add the 12oz of beer and simmer until reduced by half, stirring periodically. Also make sure you scrape the bottom when stirring to ensure that no flour is sticking. Once the beer is reduced, add the canned tomatoes with liquid, beef stock, water, sausage (Chouriço or Linguiça), 1tsp each of salt and black pepper, and 2tsp of paprika. Reduce the heat to medium-high and simmer uncovered for two hours, stirring periodically. After two hours add the Sriracha and raw shrimp, simmer uncovered for 10 minutes at medium-low, stirring periodically. Taste the broth and add salt & pepper to taste. Add the chopped parsley and simmer for an additional two minutes. That’s it, you’re done. Ladle it over some rice, crack open a beer, and enoy!!! Once again, thanks for your patience! I promise it won’t be another 202 days before my next post… lol. Tags: cajun, comfortfood, cooking, creole, dinner, easyrecipes, family, food, foodporn, friends, gumbo, partyfood, recipes, sausage, seafood, shrimp, soup, southerncooking, tailgate. Bookmark the permalink.